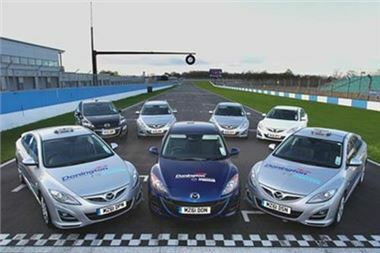 "Donington Park required reliable vehicles with responsive handling, sporty styling and driving performance credentials for use on and off track, attributes which the Mazda range delivers," commented Graeme Fudge, PR Director, Mazda UK. Mazda's new relationship with Donington Park also provides the Japanese brand with track time for testing its new 2012 Mazda MX-5 GT race car, which successfully competed in the Britcar Dunlop Production GTN Championship this year. "We are absolutely delighted to be working with Mazda UK once again, after enjoying a good relationship with the brand in 2008 and 2009. We look forward to promoting the unique benefits of Mazda's stylish product range to our wider audience in 2012," added Gemma Toogood, Head of Commercial Sales & Marketing, Donington Park Racing Ltd.
Donington's big events during 2012 include rounds of the British Touring Car Championship and both World Superbike and British Superbike championship weekends. For further information on the Mazda MX-5 GT race programme go to www.mazdamx5racing.co.uk or download the free app from the iTunes store.